We have been supplying high-quality weed-free turf for commercial and residential use for over 20 years. jumbo turf rolls being harvested. West Coast Turf is one of Western Australia’s leading turf suppliers for residential and commercial use. We currently grow three high-quality turf varieties including Buffalo Grass, Couch Grass and Kikuyu Grass. All turf is grown at our Turf Farm in Gingin Brook, 1 hour out of Perth. 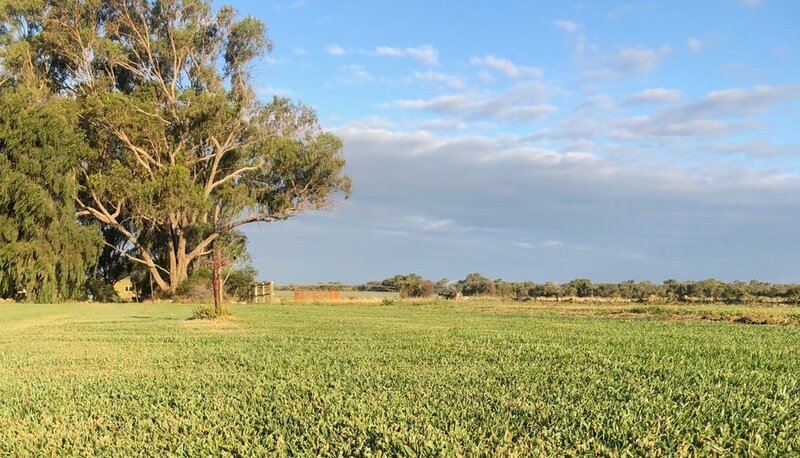 Our turf farm was started in 1993 by Greg and Kerrin Kirkwood, former Livestock and Grain farmers from the south west of WA. Today, West Coast Turf consists of 3 turf farms and with Greg having retired, Greg's sons Darren And Jason are now running the family business. With over 25 years experience, it’s safe to say we know a little about the turf industry! Kikuyu Roll on Lawn Being harvested in Gingin. Darren Kirkwood (President of the Turf Growers Association) is the Farm Manager, ensuring that West Coast Turf continues to produce quality turf at an affordable price. Jason (a former apprentice of the year winner for West Australia in Sports Turf Management) is the Operations Manager, responsible for all of the turf installation work. We specialise in both residential and commercial turf installations. West coast turf caters for turf projects of all sizes, ranging from 10m² to 100,000m². We do turf installations across the Perth Metro area and the southwestern region of Western Australia. We also have capacity to deliver to transport companies for distribution anywhere across Western Australia, including regional areas. Turf is able to be supplied as roll on lawn or shredded. We are experienced with projects of all sizes including our recent turf installations at the following locations around Perth. Kings Park where we regularly supply and install Zulu Kikuyu including 1000m² annually of Jumbo Zulu Kikuyu. Busselton Playing Fields where we supplied and installed 46000m² of Zulu kikuyu and 400m² of washed wintergreen couch for there cricket wicket. Mills Park Beckenham where we supplied 40,000m² of Village Green Kikuyu. Cambrai Retirement Village where we installed 4,000m² of roll-on Santa Ana couch for their lawn Bowling, croquet field and surrounds. Clarkson Shopping Centre where we installed 20,000m² of stolonised Winter Green for the shopping centre surrounds. Brighton Sub Division at Quinns Rocks where we installed 30,000m² of roll-on Winter Green for the estate entrances and surrounds. One of many parks where Zulu Kikuyu has been supplied installed in Ellenbrook. Call us on 9575 7520 or email us for assistance and advice. You can also order directly from the website on our orders page. We provide the most useful information we can to assist you both before and after your turf purchase. We hope that you continue to be a valued customer of West Coast Turf in the future.